Cleanse sensitive and eczema-prone skin as gently as possible with our Super Soothing Hydrating Cleanser and treat baby to a prebiotlc enhanced bathing experience. Gluco-oligosaccharide is a prebiotic that selectively fuels the growth of the healthy bacteria on your baby’s skin while inhibiting the growth of detrimental bacteria. Combine soothing Aloe Vera and hydrating Fructan with our sugar and amino acid derived cleansing agent, and we’ve got a winner! 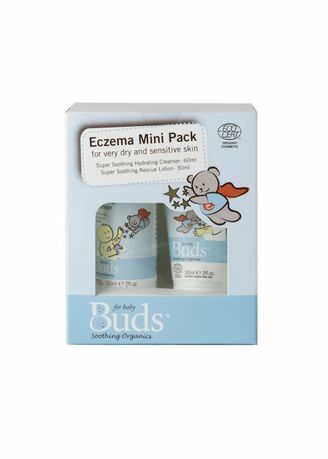 Use Super Soothing Rescue Lotion to soothe eczema prone skin. Gluco-oligosaccharide is a prebiotic that selectively fuels the growth of the healthy bacteria on your skin while inhibiting the growth of detrimental bacteria. Packed with a thoughtfully selected combination of ingredients like calming Shiso extract, soothing Aloe vera, recovery boosting Spent Grain Wax, antioxidant rich Olive Leaf extract and hydrating Fructan, this rich yet gentle cream is everything you could hope for. And to further set ourselves above and beyond the rest, our base consists of lush Jojoba, Sunflower and inca inchi oils.